I am sitting in a café at the top of a department store in the middle of Bonn, Germany. I’m here for the coffee, free Wi-Fi and easy access to a toilet. The simple needs of a traveller. It’s early in the day and people, mostly older people, are gathered in small groups or sitting alone, taking a break from their day out at the shops. Christmas has arrived in this store with glitter gift boxes, Santa and reindeer adorning displays to encourage spending. The irony of the setting is not lost on me. I arrived two nights ago for the last throes of the UN international climate negotiations, COP23. 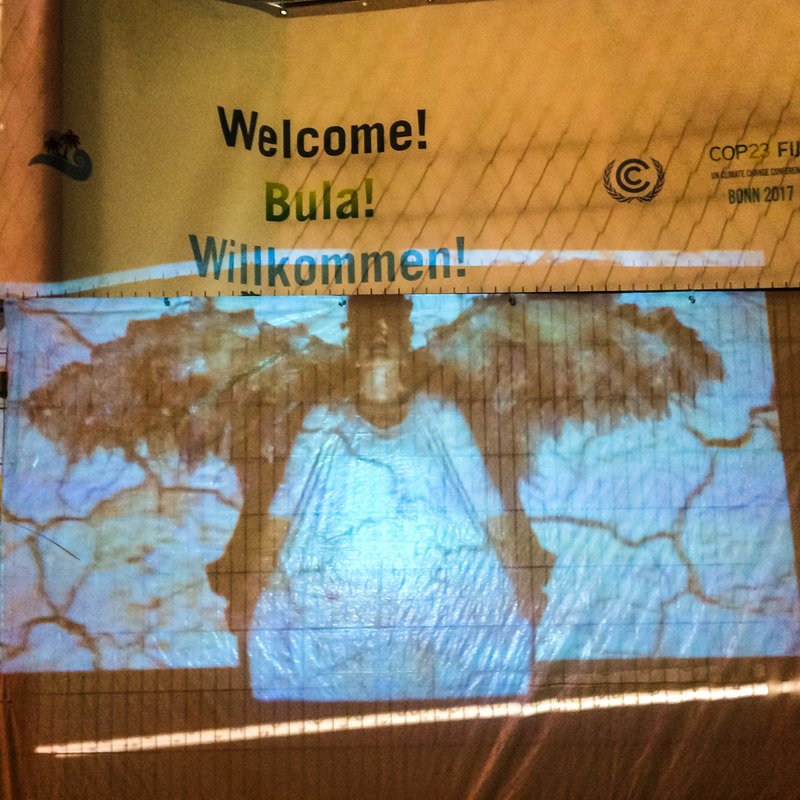 This iteration is officially hosted by Fiji, however Germany is kindly hosting it because the island nation could not conceivably manage the 20,000+ who are here in Bonn from all over the world. I applied unsuccessfully to be an official delegate. I guess they couldn’t see the benefit of having a passionate independent Australian arts producer in the mix. I came anyway. It is exactly twenty years since I was in Kyoto, Japan performing an art action with friend Clare Patey for Friends of the Earth. The historic 1997 Kyoto Protocol agreement committed signatory nations to reduce carbon emissions and address climate change. It was my first taste of international relations and the first significant international step, led by the United Nations, to address the growing environmental crisis. Even then, scientists had already predicted this crisis for many years. So much, and not enough, has happened in twenty years. Annual COP meetings have kept the issue on an International agenda with growing public support. It led to COP21’s Paris Agreement (2015), a commitment now ratified by 170 parties to the convention (of 197) to take decisive global climate action to limit the Earth’s warming to 1.5 degrees, and no more than two degrees. That is already looking highly unlikely. The crisis is deepening. Now governments are making more noise about effective climate change action with big business also at the table trying to work out how to address the issues while keeping shareholders happy. Now we all need so much more energy, with mobile phones hooked onto social media and 24/7 cycles, spin marketing, fake news and syndicated reality TV, all heavily funded by billionaires who have been squirrelling away vast sums of money into tax havens. Democratic governments are less stable. By example, German Chancellor Angela Merkel’s long awaited announcement that her country would phase out of coal-fired power was not delivered because her new government still has not formed following the recent election. Around Bonn there are COP23 signs at the railway and bus stations welcoming delegates with directions to the meeting compound on the outskirts of town. There’s little evidence of the event here at the Galleria Café on this bright Friday morning. With a strong urge to take action, I’m here as a member of ClimActs with a short film, ‘Only One Earth’ featuring the Climate Guardians from Melbourne, Australia. 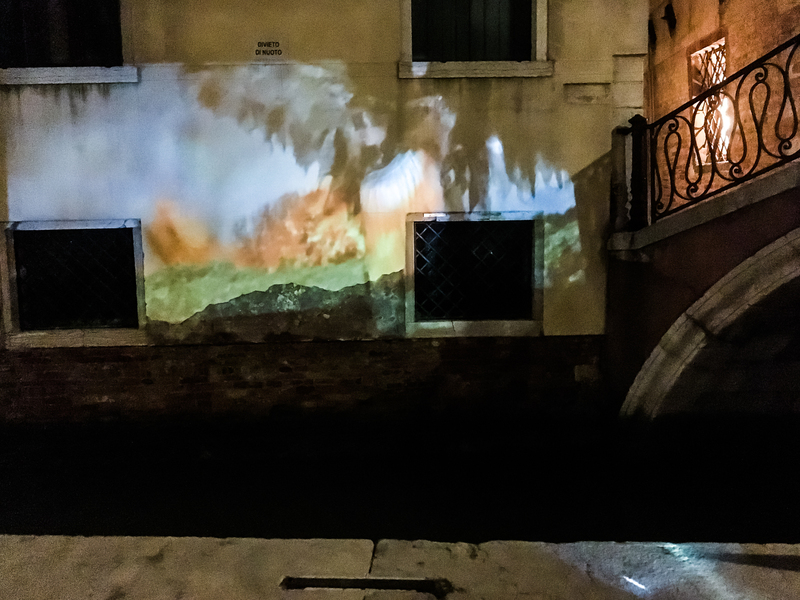 ClimActs is a politically strategic, voluntary run Australian performance collective using visual spectacle as well as satire to communicate the urgent need for the world to respond to grave threats from climate change. 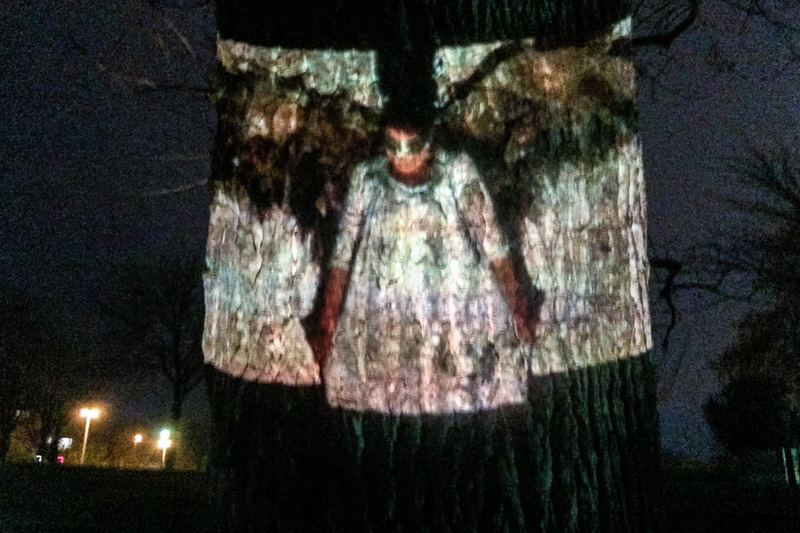 The group’s founding act, Climate Guardians use angel iconography to represent selfless and fearless care and guardianship of the natural world. They are a fine example of the growing global movement in art activism..
Alongside many climate activists from all around the world, the Climate Guardians played a key role in public demonstrations during the COP21 meeting in Paris. Designed to be projected to coincide with the Bonn meeting, ClimActs’ short film shows angels drenched in natural disaster; collapsing ice caps, coral bleaching and big storms, as they bear witness to a cycle of devastating weather events. In Australia the Climate Guardians are actively engaged in the Stop Adani campaign to prevent the Carmichael Coal Mine, the largest new coal project in the world. Approved by the Australian Government only days after COP21, endorsing this mine flies in the face of Australia’s pledge to the Paris Agreement. Worse still, Adani has been promised $1 billion in public subsidies to assist with new infrastructure to enable the disastrous project. So, armed with my laptop and small battery operated projector I’m ready for some guerilla climate action. I spent the first day scouting sites at the UN Conference Centre and surrounds at Rheinaue Park. 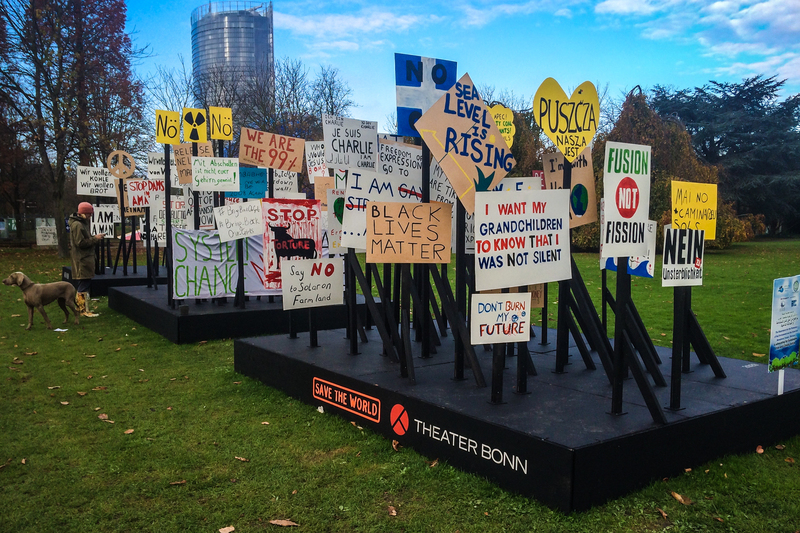 There were a few dedicated actions for the public there including an installation by UK company Stans Café working with Theater Bonn two trucks covered in protest signs from the past 50 years; from Nuclear Disarmament to the Occupy Movement, Free Nelson Mandela to Black Lives Matter, highlighting connected issues and the need for an inclusive transition plan that will deliver greater equality. 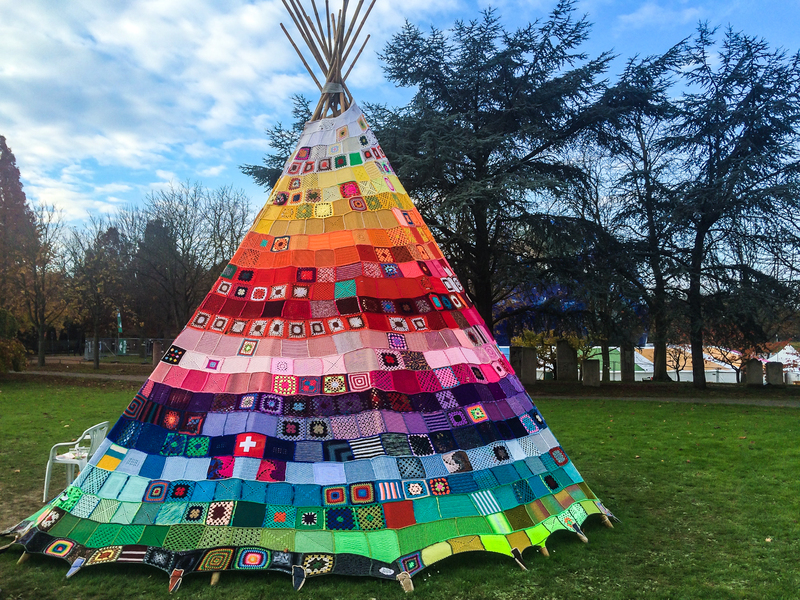 A cluster of scout tents (shout out to my son Louie) celebrates the role of young people in a changing climate; an Alaskan Teepee made from patch work squares by 1022 women; a sustainable forests project by local foresters, refugee figures tied to trees. 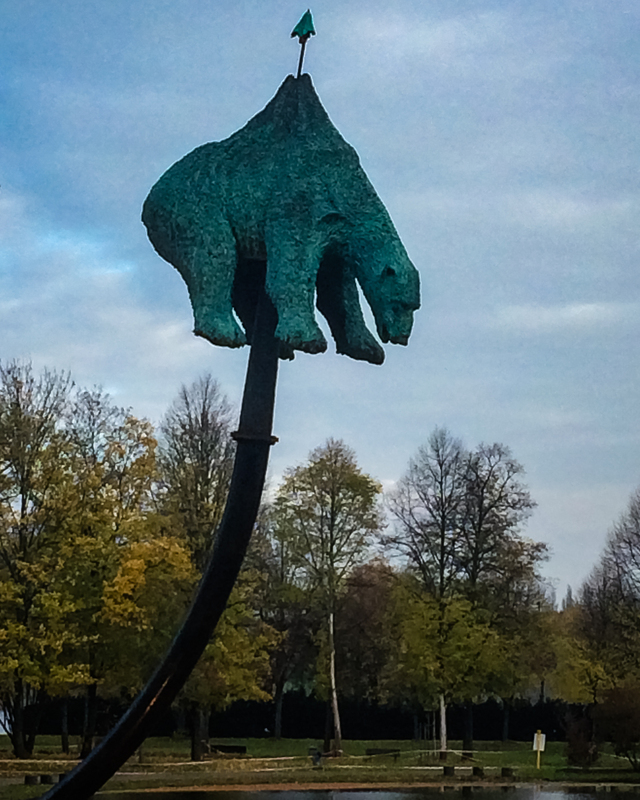 Perhaps the most arresting works are a sickly bronze polar bear impaled on a spike connected to a gas pipe next to a smoke pumping statue of Liberty with ‘USA – Right to pollute’ writ large. 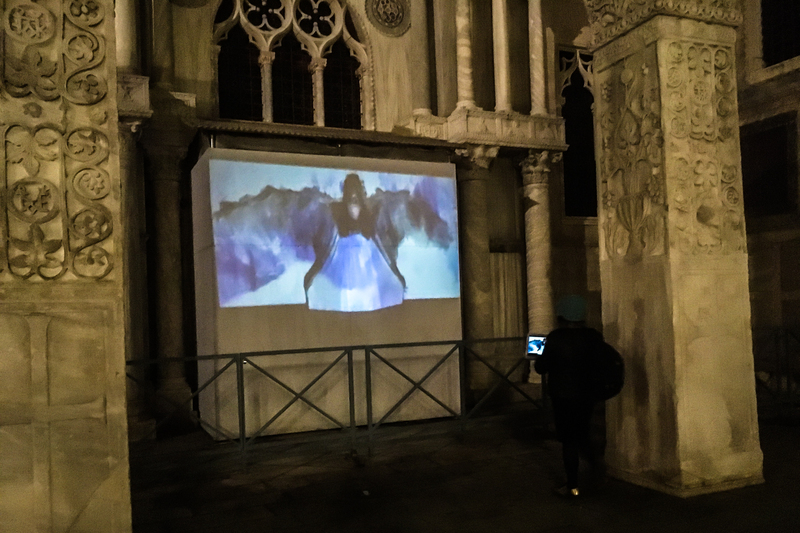 This art trail marks the delegate journey between two temporary sites of the COP meeting. Sadly few bodies are around to interpret the messages for the general public. Admittedly I came late, there was more public action at the start of the meeting, a 3000 strong cycling event and a 20,000 strong march. Given the severity of the situation, with ongoing calls for action from world leading scientists, the lack of human engagement outside the COP compounds feels quite shocking. After dark I head back to Rheinaue Park to start work. The projector is small and suffers from so much temporary light pollution. 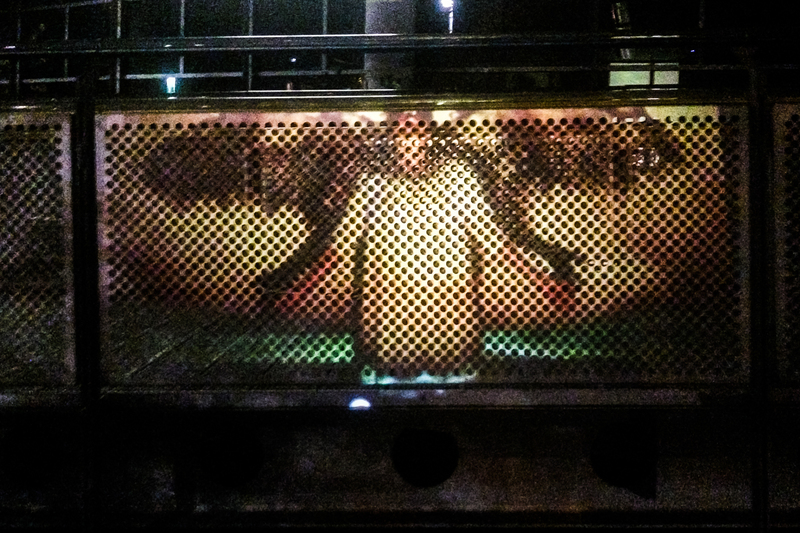 I find trees, empty billboards and other friendly surfaces on which to show the film. I linger in the ornamental Japanese Garden and remember Kyoto, waiting for Al Gore, then vice president of the USA. Apparently he was around yesterday to support the WE ARE STILL IN – USA Climate Action Centre. In the darker places, people slow, gather in small groups to watch the flickering images, and then continue on their way. Some ask me what I am doing; most take it in their stride. I am preaching to the converted here, a very small act in the face of a monumental problem. Above one of the sprawling temporary compounds there is a typical German night market complete with handicrafts and Gluhwein, locally made treats and a large Ferris wheel spewing gaudy light into the darkness. Locals mingle with delegates. A stallholder tells me the market is specially created for the COP delegates to add authentic local flavour. There is no mention of climate action or carbon emissions here. Bemused she lets me project the film on the side of her stall. My general impression is that the people of Bonn have been little impacted by the COP23 meeting, and worse see it as an ‘opportunity’ for economic gain. The hotel and hostel prices tripled in the weeks leading to the meeting. Restaurants are buzzing, as the drive for profit overrides other ethical concerns. I suspect the contradiction is lost on most people. This is my perennial preoccupation, how the underlying and unquestioned structures of society undermine any call for change. Short-term gain despite the threat of long-term pain is the mantra of the moment. I know there have been some supposedly green infrastructure gains in the region, a new overdue tram stop at the Bonn UN Conference centre for example. In light of the economic disparity between Fiji and Germany, the generous host seems to be reaping benefits. I wonder whether Fijians have fared as well? Perhaps they have more urgent concerns as low-lying islands prepare to immediately evacuate due to sea level rise. Can you imagine having to leave your life and culture forever? Unlike refugees there is no hope of return. This grief will set the future for so many. After a few hours in the cold I head home. I’m staying with a wonderful host family. I met Ulrike and Johannes online through their neighbour via an activist website. They have been incredibly hospitable, providing a bed, food and helping me to navigate the town. Their English is terrific although they rarely travel abroad, sometimes in the summer, and haven’t boarded a plane in 20 years. My German is non-existent, I joke with Ulrike that I have used all their carbon miles for them. Flying is by far the worst of my carbon sins. Survival in the Arts in Australia and in a globalised world is increasingly dependent on International travel. Success is largely counted in bed nights and air miles – reinforcing the spend on capital and oil – at the heart of the climate crisis. That irony cuts deep. Thanks to the Australia Council for the Arts, I’m in Europe for an International Performing Arts Meeting (IETM) in Brussels next week. While there are many individual artists tackling climate change, my sector isn’t responding very effectively on this issue as we strive to survive in an economic system that fails to value arts and culture in the same way that it fails to value the Earth’s vital ecosystems that support it. Without a clear path forward and largely dependent on subsidies from governments we maintain business as usual, even when the business is clearly not working very well. My side trip to Bonn was a chance to gain insight, meet like minds and better understand the severity of the situation from experts. Even dedicated activists need inspiration. On the train back into town I meet Susie, an environmental scientist from Australia and Emanuel from the Senegalese delegation. So late in the negotiations Emanuel was concerned that little agreement had been reached about how the targets can be uniformly measured across different nations. Still, he was enthusiastic about the possible gains for his country. This contradictory idea of combating climate change through economic growth seems to drive at the heart of our problems. And who am I, from a wealthy privileged nation, to deny a poor country the right to develop. I also see how culture is used to spark these ambitions, as an acutrement of wealth and power. Meanwhile, two youth delegates, from the UK and Brazil, talk excitedly about the opportunity to lead a sustainable future. They were unimpressed by Al Gore and his blatant self-promotion. They say the future is collective. I cling to their hope. Ulrike and Johannes are an inspiration, busy offering very practical support for refugee families after Germany generously opened its doors in 2015 as tens of thousands swept into Europe. That crisis will only increase as more people are displaced by the changing climate. Australia is no example, with Government intent on keeping displaced people out and international outcry increases over inhumane offshore detention. We have developed our wealth, through exploiting global markets, investing in conflict and exacerbating problems that lead to people fleeing their homes. Surely we are obligated to help. Leaving the café, my last appointment in Bonn is with Andrew Potts, a lawyer from Washington DC who is also interested in the intersection of heritage, culture, sustainability and climate change. We first met at a United Cities and Local Government Conference (UCLG) in Jeju, South Korea in May. The UCLG had put Climate Change on the agenda during their cultural summit but seemed reticent to lead ongoing action. I do understand. Faced with so many challenges this issue can still seems like an optional extra. It is scary to face the threat, ask difficult questions, drill into supply chains and see the life you have led with so many hard won successes and long harboured dreams start to unravel. Andrew spun my head with acronyms articulating complex layers of global bureaucracy that manage intercultural relations around heritage and culture. We talk for hours about how to more effectively match policy with practice, develop sound models for retaining culture with communities forced to move from their land and how to reimagine creatively agile systems in the twisted highway of international development and diplomacy. Here too are more people flying around the world to talk together. How can we break these unsustainable patterns? It’s a big and deeply personal question for this well worn traveller. After a final evening of guerilla film action in the centre of town, I wave goodbye to Bonn and my generous hosts to set off cross-country to Venice and the 57th Biennale. The first artwork I see from the ferry is two hands rising from the water to hold up a building, water lapping at the wrists. This drowning city, built on swamp, is possibly the founder of modern globalisation. With early trade routes around the world the Venetians specialised in, and created a market for lavish lifestyle and luxury goods. Look where that has taken us. The Biennale is food for my soul and yet I also know it has inspired a global trend where post industrial cities plan cultural events to attract tourists. More bed nights and air miles. Interestingly the artworks show clear division between abstract conceptual pieces using unsustainable industrial materials such as steel, concrete and plastic alongside more organic, mythological and digital narrative works. Many artists are grappling with current crisis; refugees, climate change, corporate greed and the struggle for identity in a changing world. Lisa Reihana’s playful work Emissaries explores the real and imagined impact of colonisation on New Zealand and is a clear winner for me. I believe we are on the verge of a new integrated cultural epoch, beyond contemporary art, inspired by First Nations cultures, with a more holistic approach to art, innovation, nature and how we all live together on our beautiful planet. Throughout COP23 a Drua, a Fijian ocean-faring canoe was on display to symbolise that we are all in the same canoe on Climate Change and must all fill the sails with collective climate action. I’m going home inspired to focus locally and start a group in my neighbourhood. I will continue to bang on to anyone who will listen about the vital role for the creative sector in adaptation to a warmer climate, a core mission of the Paris Agreement. I’ll continue to expose and explore the structures that obstruct much needed change. Artists can enable new imagination for what now seem impossible challenges, offer hope, express difficult feelings, share creative life skills and weave vital connection between silo’d strands of activity. We are courageous, flexibile, have compassion and our values are less tied to profit margins than most business or, these days, government. There is change in the air; it is happening… slowly… the only certainty is that we must urgently hurry the process. This is where art combined with activism can play a leading role.